You will be aware that school leaders from across West Sussex have been meeting with local MPs – Jeremy Quin and Nick Herbert – and the Leader of West Sussex County Council, Louise Goldsmith, in order to pursue our goal of gaining £20m interim funding for April 2017. At the time of writing we are extremely disappointed that we have no positive news to report. 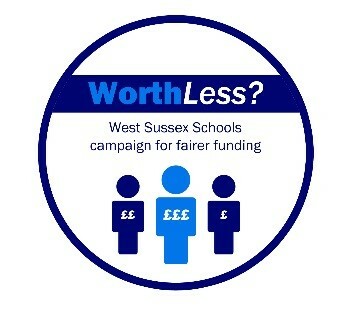 In short, despite the fact that there is no dispute over the funding figures provided or indeed our current dire financial situation, no additional money is being provided to West Sussex schools/academies. We remain grateful to local politicians for their continuing engagement with the Worth Less? campaign and for their lobbying work at Westminster in support of our request. All local MPs have confirmed that they will continue to help us to secure this vital additional funding. School leaders recognise that the introduction of a new National Funding Formula may well alleviate our financial problems in the future but we all know that any positive effects are some considerable way off. In light of this, school leaders are reviewing what further actions we need to take. Our first inclination is to continue working alongside political leaders to try and secure additional funding by January 2017. If we are not successful at this point, we will continue to consult with all of our stakeholders in order to find the best way forward. There should be no doubt in anyone’s minds, however, that our financial situation is very bad indeed and without immediate help the provision for pupils in all of our school settings will be severely and detrimentally affected. We continue to be extremely grateful for your support and will update you further in due course.